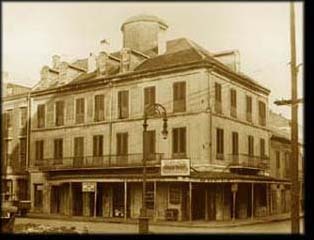 During the spring and summer months, whenever I’m in the French Quarter, I usually stop by Napoleon House for a drink. Their Pimm’s Cup is incredibly refreshing and the ambiance of this 200 year old building has always been worth the stop after a day of working, shopping, or touring. I have got to tell you, though, that the drink doesn’t have quite the same impact when it is under 40 degrees outside! Brrr! It was lunch time and my dining companion had their toasted mufaletto. Because of the cold weather, the melted cheese was a nice variation but there is too much pepperoncini in their olive salad for my taste. I had the red beans and rice and my meal was remarkably flavorless. Who even knew that was possible? While I’ve had decent food there in the past, it is their famous drink that keeps this place on my regular visit list.